I grew up at airports. Small ones—the municipal kind with no terminals, no TSA. Just a bunch of rusted birds and crusty old pilots itching to scrape the sky. Throughout my childhood, we traveled the countryside in search of the perfect wave. My dad is a sailplane pilot, you see, which requires a very particular set of conditions with which to fly. Sailplanes don’t have motors. Towed up by a fixed-wing plane, launched via winch or rolled off a cliff (seriously), gliders are a rare breed. Glider pilots rely on warming air and terrain features to gain altitude, after which they demonstrate the plane’s incredible 40:1 glide ratio, covering vast distances simply by controlling their descent. 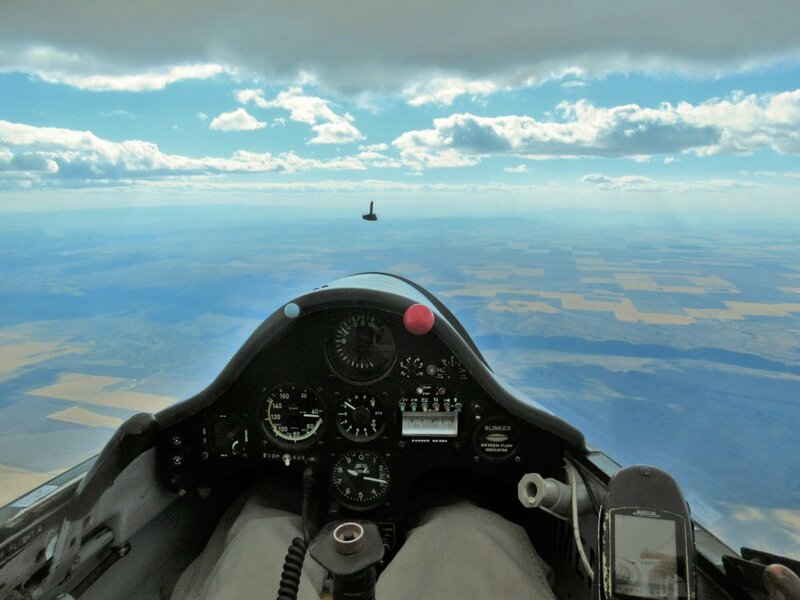 A seasoned glider pilot can travel hundreds of miles in a single day, climbing to heights which require supplemental oxygen, all without an engine. The good ones can stay up all day till the sun sets, the winds die and the warmth disappears. Their main squeeze is the thermal, a column of rising air invisible to mere mortals, yet painstakingly obvious if you know how to read the clouds. A flat-bottomed cumulus is a great place to start. Oftentimes, underneath you will find a warm pocket created by heat rising over an open field, a pile of rocks or a hot parking lot. A dust devil is a surefire giveaway. Once you hit a thermal, the variometer, a noisy little devil designed to indicate sudden changes in air pressure, chirps to life. The pilot must bank immediately to stay in the spiral, steeply angling the wingtip toward the Earth, pivoting round an imaginary point drawn by his internal protractor. Up and up and up he climbs, till finally the world falls away, the only sound is that of the wind whistling through the canopy. My job growing up was to serve as scribe. At the annual competition, glider pilots from across the region would gather to prove their aeronautical prowess. Twenty or more aircraft would stage themselves on the tarmac, waiting for a lift. One by one, they’d hook up to the line, give the tow plane a thumbs up, and roll aloft. Using my trusty clipboard and neatest penmanship, I would carefully notate each call sign and roll-off time, knowing that every second counts in the game of flight. Pilots are judged on three factors: altitude, distance and speed. Points are awarded for each category such that the pilot with the highest, furthest and fastest flight wins. It is designed to test the mettle of speed demons, long-distance fliers and mountain climbers alike. The race acts mercilessly on every man and woman who enters—you must be a master of all three to win. It’s important to note the differences between a glider and your typical Boeing 777. Littered with bells and whistles, an airliner is programmed to avoid failure at all costs. It is designed to move tons of goods and hundreds of people all over the world, all day long. The glider, by contrast, is equipped with only the most basic instruments. Rudders, tail flap and ailerons are controlled by hand and feet. Whereas a Boeing is practical, the glider is ethereal—a true Zen experience to be understood only by the solo pilot. Flying a glider requires impeccable concentration and calculation. You must constantly weigh the myriad factors involved with staying in the air: how far you have traveled, what the weather is doing, how high you can get, and how far it will be to return to the airport. In a pinch, glider pilots may return to a previous thermal marked on their GPS. Sometimes they find them, sometimes they’ve disappeared. Other times, they may venture ahead, wagering on discovering the next big rise. Every pilot has her own level of acceptable risk. Landing out was great fun as kids. In came the transmission. “Oh, boy! Dad landed out? Time for a road trip!” Hooking up the 40-foot trailer, off we went, bouncing down country backroads, mom honing in on dad’s coordinates via VHF radio. Eventually, we’d find him, often sitting on the porch with the farmer whose field he’d conveniently plowed, knocking back a cold one and laughing at their newfound friendship. The next day, that pilot would get to regale his comrades with the story of his landout, earning deep-bellied chuckles and slaps on the back from fellow fliers who know all too well how it feels to have risked it all and won the real consolation prize—courage, respect, and a lesson well-learned. Why are we so afraid of landing out? Life is just one big game. The gamification of business is no different. You pay to play. Risk to reward. The bigger the plane, the higher the stakes. The more moving parts, the greater the chance of mechanical failure. Landing out isn’t so bad, really. It doesn’t have to be about life and death. So you or your plane get banged up now and then. If you land out, it’s okay—your support group will come to your rescue. They would never leave us stranded. You simply head back to the airport, swallow your pride and try again. To that end, we would do well to celebrate our failures, not hide them. We cannot grow within our comfort zone. You can never know until you try. I’d rather take the risk and face failure than spend a lifetime wondering what I may have missed. We both chose the latter.